Prominent Maryland attorneys have drawn from their extensive experience and collaborated to bring you strategies and forms for virtually every situation you may encounter in this newly revised two-volume Manual featuring a bonus of 300 electronic forms. This extensive, updated manual, with its 1,500 pages of valuable content, will help you stay current and efficient by providing appropriate statutes and regulations – complemented by thorough discussions and analyses of any changing federal and Maryland state laws. Plus, you’ll be expertly guided through an extensive selection of appropriate LLC forms using an easy-to-follow format. Included are customizable electronic forms as well as explanations and planning strategies for the LLC business structure. New section on the effects of the 2017 Federal Tax Cuts and Jobs Act on limited liability companies. New section on voting by proxy and an accompanying form. New section on voting trusts agreements and an accompanying form. New section on other special rights of first refusal. New form on right of first refusal in the event of a sale transaction. Updated forms throughout the Manual. Robert M. Ercole, Esq., a principal in the law firm of Neuberger, Quinn, Gielen, Rubin & Gibber, P.A., focusing on individual and business tax and corporate planning, real estate joint ventures and financing, and mergers and acquisitions. He received his B.S. from the University of Pennsylvania, Wharton School of Business; his J.D. from the University of Maryland School of Law; and is a Certified Public Accountant (CPA) in the state of Maryland. Stuart Levine, Esq., practices in Baltimore, primarily in the areas of business acquisitions and dispositions, Federal and state tax litigation, forming and operating corporations and LLCs, and general corporate representation. He received his B.A. from the University of Maryland College Park; his J.D. from the University of Baltimore; and his LL.M. in taxation from the Georgetown University Law Center. 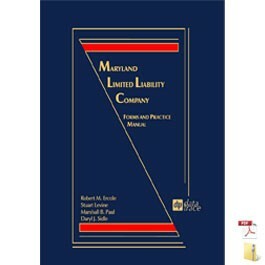 Marshall B. Paul, Esq., is a corporate partner with Saul Ewing Arnstein & Lehr LLP and an adjunct faculty member at University of Maryland Law School and has lectured extensively on the topic of limited liability companies. He received his B.A. from Johns Hopkins University; his J.D. from the University of Maryland School of Law; and his LL.M. in taxation from the Georgetown University Law Center. Daryl J. Sidle, Esq., is a principal in the law firm of Baxter, Baker, Sidle, Conn & Jones, P.A., where he specializes in business planning, mergers and acquisitions, real estate tax planning, and estate tax planning. He is a graduate of Johns Hopkins University, Princeton University, and The University of Maryland School of Law.